The Iceland Itinerary Is Finalised. Again. Hot on the heels of the last update plans for the trip have moved forward. I’ve decided on the itinerary, booked flights, the 4WD rental and even finalised all the accommodation. Which yes, does mean that I’ve come to a decision on the dates. One of the things I was unsure of was simply the mechanics of travelling the 380km from Jokulsarlon to Keflavik in time for the flight, all on the same day. Knowing my luck, the 4WD would suffer some kind of terminal failure, I’d miss the flight and be stranded. The flip side was that, whilst the first version of the itinerary allowed a couple of extra days on the Reykjanesbaer peninsula – where the airport is located – it also spanned three weekends. That was three weekends of potential overtime at work, which ultimately pay for these trips. It was such a quandary. I was also beginning to make the same mistake as the 2013 trip: Trying to fit in more and more locations. I had already began looking into the possibility of travelling north of Reykjavik based on a number of wonderful landscape shots I’d seen. It was only when I added up the days and cost that I realised I was attempting to do too much. Early afternoon flight to Keflavik International, pick up 4WD rental and check in to a local hotel on the Reykjanesbaer peninsula. Go exploring on the Reykjanesbaer peninsula. In the afternoon, drive the 190km to Vik, undoubtably stopping along the way. Based in Vik, spend five days exploring the surrounding area, up to 100km or so. Drive over to the next base camp near Skaftafell national park. This is only 190km so again, I’m sure I’ll be stopping a few times. A close base camp to Skaftafell National Park means spending time around, and on, Vatnajokull, Europe’s largest glacier. Move to a base 40km east of Jokulsarlon and continue exploring. 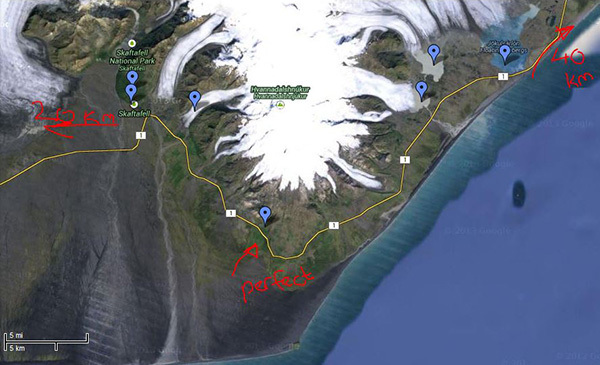 The move is more out of necessity as the hotel I’m in at Skaftafell is booked after after June 1st. Drive to Reykjavik, return the 4WD and be out for some evening photography along the harbour. A day relaxing in Reykjavik satisfying my needs for some architectural photography. Tying up last minute shots in the morning and fly out in the late afternoon. For me, there’s a good balance of time here. In Antarctica I often found there wasn’t much time to compose shots – everything was moving and you were kept on a tight itinerary which, although understandable for certain destinations, is the one thing I dislike about organised trips. Here, there is no clock to watch and with five days in Vik alone, I’ve allowed plenty of time to slow down and work each location. Maybe too much time, but I’ll only know that in a few months. The surprise is Reykjavik being included at all. I was quite keen to avoid it altogether and simply concentrate on the landscape aspect but, well, I can’t resist good architecture and I’ve wanted Hallgrimskirkja as a subject for a while. Plus, with just over two weeks of near solitude, being in a populated area will make a nice change. So, the holiday is signed off at work, flights were purchased yesterday, as was the rental of the 4WD. Five sets of accommodation are all booked too and I’ve a good idea of where I want to be and see. In short, Iceland 2014 is born. All I’ve got to do now is not mess it all up by changing things! Now that the two, primary base camps have been chosen and dates selected – largely based on the availability of accommodation, I’m now beginning to consider the side trips. Of course, in my world nothing is ever quite as easy as it would appear, so this week has been set aside to deciding whether I should land at Keflavik, hop in the 4WD and head straight over to Vik – the original plan – or if I should hang around on the peninsula, spend a couple of days there and then heading over to Vik. Unsurprisingly, it’s a surprisingly big decision. Ordinarily it wouldn’t really matter: I want to see both areas and given the few days difference the weather isn’t really going to change significantly – at least none more so than Iceland’s weather does anyway. The issue is not so much with what happens at the beginning of the trip but more to do with what happens at the end. The last big base for photography is Jokulsarlon, located roughly halfway along the southern coast and approximately 420km from Keflavik. In the original plan, I drive back from Jokulsarlon to a guesthouse near the airport and then spend a couple of days driving around the peninsula. Doing it in this order has the rather handy advantage that, should something happen – such as the 4WD breaking down or absolutely perfect light descends over the glacier and lagoon – then I have the slack time to stay without worrying about missed flights etc. Visiting the peninsula first means either no slack time or additional days and cost. Reading this far you’re likely still wondering why this is an issue, after all I’ve already mentioned that the weather is not really going to change. The problem is to do with the days I’ve picked: As it stands the trip falls over three weekends. As I use the overtime earned by working weekends to pay for these trips, it would be really handy to travel midweek and only be away for two weekends. It’s a cold, wet and generally unpleasant day outside here in my part of the UK and so I’ve been making good use of time in front of the computer: Planning Iceland 2014! To recap the previous itinerary, I was attempting a circumnavigation of the island along the (roughly) circular route 1. It was to take 19 days and cost in excess of £3000 which, whilst expensive, is cheaper than some other destinations. The problem was not so much the cost but the imbalanced itinerary: approximately two-thirds of the time and cost was being spent along the south and south-east coast with a mad dash around the remaining part of the island, resulting in a lot of driving, not much stopping and no ‘slack’ time at locations to allow me to return should bad weather hamper the photography. Also, some of the accommodation I had booked was based on what was available at the time and not necessarily convenient for a key location meaning long, early morning drives, again not necessarily knowing what the weather would be like upon arrival. So, I cancelled the trip, lost about £300 in non-returnable deposits and had a sulk. Not one to feel sorry for myself (for long, at least) I decided I should return to the plan allowing a bit more time before the departure date and focus the itinerary. As it is, work has been busy with various projects and, as it is the overtime that pays for my trips, evenings and weekends have been scarce. It is only today that I have had a chance to sit down and dedicate some time to the new itinerary free from distractions. And, progress has been made. Eventually. The first mistake I made was to do the obvious: Decide how long I want to travel for, when I want to go and then begin dividing up the time between the key locations. This would be a brilliant approach if I were the only person thinking of visiting Iceland at the time, but of course I’m not and Jokulsarlon – one of two key locations for me – is a generally popular spot resulting in very limited accommodation options at the best of times. Given the dates this approach gave me I could either spend in excess of £700 for five nights in a conveniently located hotel, spend a more palatable £450 for one 40km east of the glacial lagoon and 80km east of the Skaftafell National Park, or I could camp. What I really wanted was a convenient, and cheap, place to stay for both the lagoon and the national park. Which surprisingly does exist as I discovered when I planned the 2013 accommodation. To be fair, the convenient-and-cheap hotel doesn’t exactly get rave reviews, but after an eye-opening stay on a Chinese farm a few years ago I’ve have a generally liberal view on these things. After all, I’m not moving in. So began the game of entering dates into the booking web site and seeing if the hotel had vacancies and after few iterations – during which I gave up on working out proposed flight and car rental dates – I had some dates for when the hotel was available. Of course it wasn’t as simple as that: One of the reasons I want to go to Skaftafell is that there is a full-day glacial walk tour that heads out from there, but the season starts on June 1st – the last day the hotel is available – meaning I would have to check out, go on a seven hour hike and then drive back to Thingvellir National Park. A long day and a plan leaving no time for contingencies (such as tour being delayed due to weather etc.). In the end, I’ve adopted a split approach – check into the cheap-and-cheerful hotel, use it as a base for Skaftafell National Park and, maybe, Jokulsarlon. Then check out on the 1st, go on the glacier walking excursion and then drive over to the guesthouse 40km east of the glacial lake. Whilst it sounds like a bit of an aggravation, the new guesthouse is only three kilometres further from Jokulsarlon than the cheap-and-cheerful place is and offers a different vantage point from which to explore the landscape. Also, should the glacial walk be delayed a couple of days, at least I’m still in the area. So, eight hours of work later and I have a hook to hang the new itinerary upon. Not a bad way spend the first day of 2014!